SPOONFEST is designed first and foremost to be fun and to be inspirational. Over the last few years spooncarving has come a long way in the UK and grown in popularity. 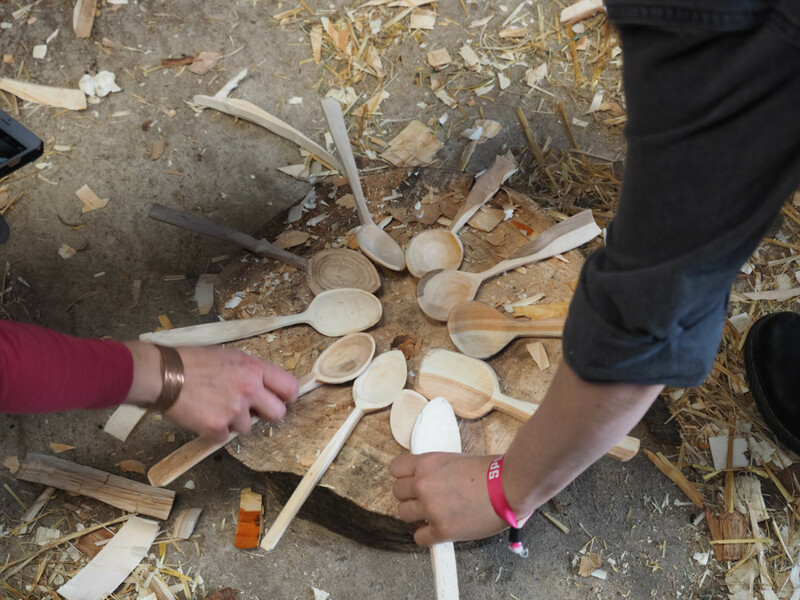 The idea is to bring all those carvers together – from raw beginners to seasoned professionals – for a three days celebrating the wooden spoon. Everyone arrives Thursday evening sets up tents sorts food then 7.30pm we have our official opening ceremony and introduce all our workshop leaders each with a few words about their work and what they will teach. We then have our keynote speech. A nearby barn will house the GALLERY. This is a place of inspiration with many spoons from the best carvers in the world today, Jogge and Wille Sundqvist Fritioff Runhall, Peter Kohidi, Jarrod Stone Dahl and many many more. You will simply never get the chance to see so many good spoons in one place. Bring your camera, your sketchbook and be prepared for spoon overload. 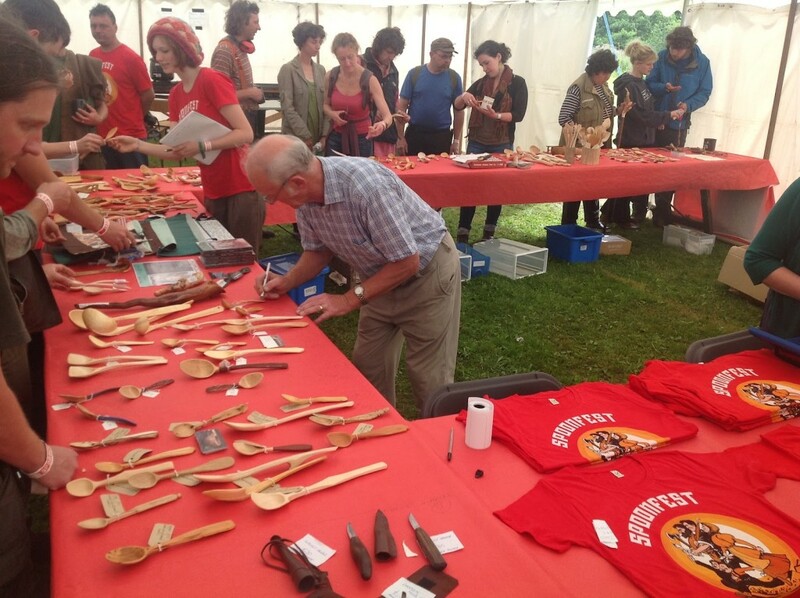 We are also asking you (the attendees) to bring along spoons you have carved to show off in the INSTANT GALLERY. Finally we will have spoons from Robin’s own worldwide collection on display, and a LIBRARY of all those hard to get, out of print, books. The gallery has tea and coffee making facilities so you can relax browse through 200 or more inspirational spoony, woody and craft books. 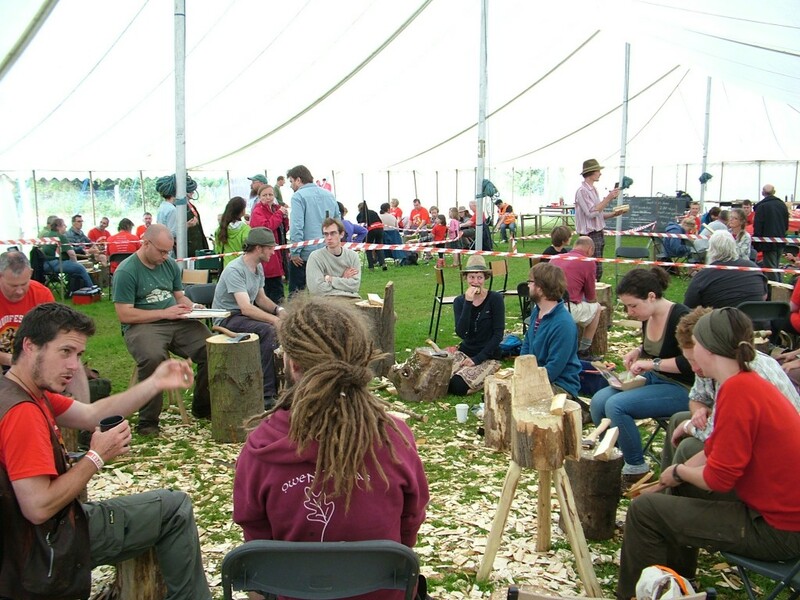 There will be areas for you to sit and carve together chatting, exchanging ideas and SHARING SKILLS. We will provide plenty of great carving wood, chopping blocks and free tea and coffee. Large barns will keep us dry if it rains, and house talks. For the evenings there will be local beer and hay bales round campfires, bring musical instruments if you like. FREE DEMONSTRATIONS AND TALKS will also take place throughout the weekend, these will be pre-arranged so if you have something you can offer that you think may be of interest please do get in touch with Barn or Robin. Over the years talks have ranged from knife sharpening and bark sheath making to correct posture for safe carving and a talk about the history of monastic spooncarvers. On Friday we will have basic knife carving techniques WORKSHOPS where anyone can learn to use a knife safely and efficiently all run by excellent teachers lasting 1 1/2 hours each. There will be a small charge (£10) for the workshops – payable on the day to the workshop leaders. On Saturday and Sunday we will have some more advanced workshops in various subjects, including advanced spoon design, making paint and decorating spoons, chip carving and advanced axe technique. Full details of all workshops will be available on the line up page (we promise we will update it eventually). TRY BEFORE YOU BUY…Good tools are expensive. How do you know which are best? We will have most of the best available options for carving axes and spoon knives available in an area for you to work with and see what works for you. If you are a maker and would like to send us knives for folk to try out get in touch. SPOONSHOP will be open set hours through the weekend and be the place to buy and sell spoons. 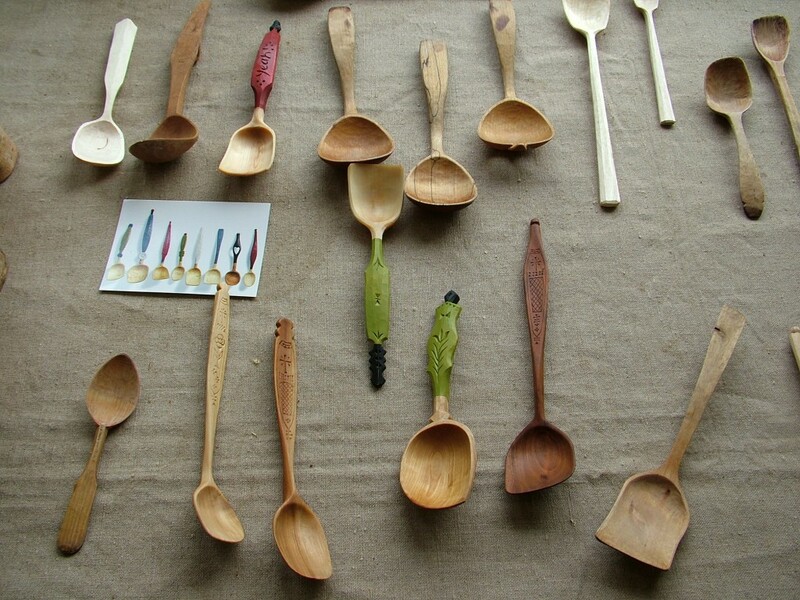 Personally I can not resist a good spoon and it seemed daft to have all these amazing carvers together and not offer the chance to buy some of their work. Anyone can offer work for sale through spoon shop (spoons only) and there will be a very small commission (10%) to cover admin costs. SPOONCLUB this is the event that wraps everything up and perhaps the highlight of the weekend, around 4 pm on Sunday we all get to together on what is probably the biggest communal collaborative spooncarving that the world has ever seen. It is great fun. There will be good quality local FOOD available to buy on site at reasonable prices. The Thali Truck will be on site throughout the event so you can buy breakfast lunch and dinner if you like. We’ll also have a pizza oven running for charity and a BBQ for you to “bring and burn” your own. At 7pm we put all tools away and the bar opens. The CHARITY BAR is run by volunteers, serves excellent local beer from Farmers brewery and over the years we’ve raised over £10k for charity. Our chosen charity again this year will be Practical Action (some may know them better by their old name of Intermediate Technology) . Edale is in the heart of the Peak District tourist area so there are B&B’s, holiday cottages and a youth hostel within walking distance for those that wish, but there is free camping on site along with portaloos, flush loos and some showers – although we anticipate long queues for those. Any more questions? Check the info page and the FAQ.